Welcome to Notes From New York, a monthly jazz column by Bill Milkowski that includes observations on the scene along with interview snippets, gossip and gig information. 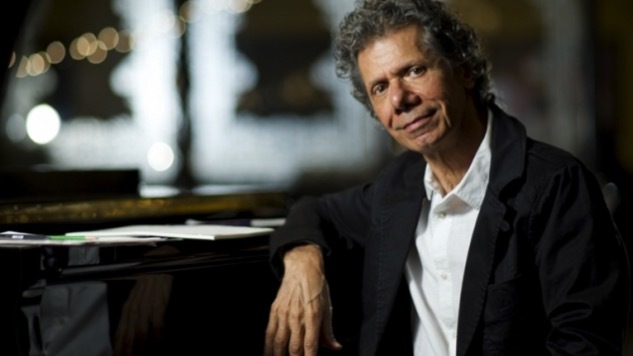 To celebrate his 75th birthday, pianist-composer Chick Corea took over the Blue Note nightclub for an eight-week residency in which he showcased several bands from throughout his illustrious career. He kicked off the gala with a salute to former employer (from 1969-1970) Miles Davis featuring an all-star group of former Miles sidemen from different eras—bassist Marcus Miller and guitarist Mike Stern from the celebrated comeback band of 1980, alto saxophonist Kenny Garrett from Miles’ last touring band of 1990, and trumpeter Wallace Roney, who appeared alongside Miles at his celebrated orchestral performance at the 1991 Montreux Jazz Festival. Only drummer Brian Blade had no previous encounter with Miles. The gig marked Stern’s return to the scene following a three-month hiatus due to an injury that left him unable to play (two broken humerus bones in both his shoulders, to be exact). He sat on a stool throughout the set and occasionally stood at the peak of one of his signature “chops of doom” solos. Together, this stellar group covered tunes from different eras of Miles, including “All Blues” (from 1959’s Kind of Blue), Gershwin’s “My Man’s Gone Now” (from 1958’s collaboration with Gil Evans, Porgy & Bess), “If I Were a Bell” (from 1956’s Relaxin’) and the anthemic “Jean Pierre” (from 1982’s We Want Miles). During the first half of his residency, Corea reunited his Three Quartets and Leprechaun bands (both featuring drumming great Steve Gadd), had dual piano encounters with Brad Mehldau, Gonzalo Rubalcaba and Herbie Hancock, collaborated with longtime musical partner vibraphonist-composer-educator Gary Burton and the Harlem String Quartet, and performed with Norway’s Trondheim Jazz Orchestra. The extended celebration concludes with four nights (Dec. 8-11) with a recreation of the music of Return To Forever and the Mahavishnu Orchestra featuring a dream band of legendary guitarist John McLaughlin, bassist Victor Wooten and drummer Lenny White. Small-town Canadian girl Bria Skonberg got a solid education in the music of the 1920s as a young trumpeter-singer on the scene in her hometown of Chilliwack, British Columbia. “Hot jazz has been a home base for me since I started learning how to improvise,” recalls the former leader of Bria’s Hot Five and the Mighty Aphrodite Jazz Band as well as a featured performer with Del Richards and his Orchestra. “I did a lot of playing for dances and recreating that hot jazz style, but I used my move to New York [in 2010] as an opportunity to redefine and explore what my signature sound is. And it’s been an organic progression.” She pushed the envelope on 2014’s Into Your Own, which included a raucous rendition of Jelly Roll Morton’s “Winin’ Boy Blues” and her Louis Armstrong-inspired “Six More Weeks” alongside a cover of John Lennon’s “Julia” and a mash-up of the Tin Pan Alley classic “Three Little Words” and Stevie Wonder’s “Sir Duke.” On Bria, her recent major label debut for Okeh Records/Sony Music, Skonberg delivers a sultry version of “Trust In Me” (from Disney’s The Jungle Book), swings on an Anita O’Day-inspired rendition of the jazz standard “From This Moment On,” turns in a haunting balladic version of “Que Sera,” scats her way through “Malagueña,” interprets the jazz standard “Don’t Be That Way” as a mambo and channels the hot jazz spirit on Sidney Bechet’s “Egyptian Fantasy.” And she shows further growth as a songwriter on her winning originals “Curious Game,” “My Shadow” and the playful shuffle-swing number “Wear and Tear.” which has her engaging in humorous harmony vocals with reedman and secret weapon Evan Arntzen. Meanwhile, Skonberg remains deeply connected to her roots through her New York Hot Jazz Camp and Youth Camp at the Greenwich House Music School, an educational program she started last year with singer Molly Ryan. 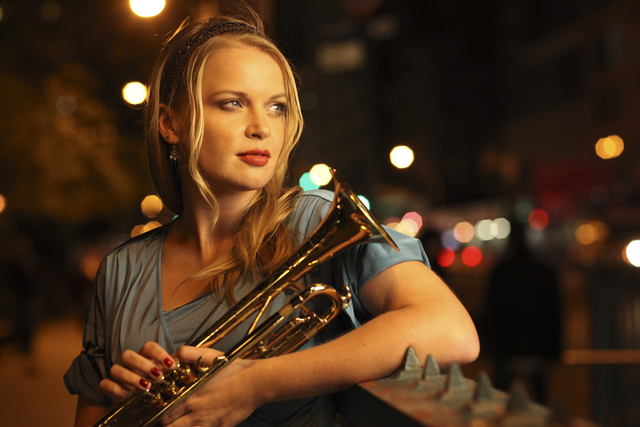 Skonberg will perform material from her new Okeh album on Dec. 8 at Dizzy’s club in Jazz at Lincoln Center. Guitar great Pat Martino, who was sidelined by a life-threatening brain aneurysm in 1980, was in classic rapid-fire form in concert at Zankel Hall with his working trio of organist Pat Bianchi and drummer Carmen Intorre augmented by tenor saxophonist Adam Niewood and trumpeter Alex Norris. Highlights included incendiary renditions of John Coltrane’s “Impressions” and Sonny Rollins’ “Oleo” along with a gorgeous reading of the lush Charles Mingus ballad “Duke Ellington’s Sound of Love,” the latter to appear on an upcoming Martino album in early 2017; Pianist-composer-arranger Carla Bley led the politically-charged Charlie Haden Liberation Music Orchestra in a powerful week-long engagement at the Jazz Standard. Highlights included the title track from their recent Impulse! album Time/Life, Bley’s tribute to the late bassist-bandleader, along with Haden’s “Not in Our Name” and a poignant reading of the hymn/protest song “We Shall Overcome.”; Ted Nash’s big band celebration on election night turned into a wake after Donald Trump shocked the nation with his victory. The saxophonist-composer-arranger and longtime member of the Lincoln Center Jazz Orchestra performed tunes from his new Motema Music release Presidential Suite: Eight Variations on Freedom to a crowd at the Jazz Standard that was mostly in mourning by the beginning of the late night set. Jazz writer Fred Kaplan was on hand to announce election updates between songs to the stunned crowd; Hard bop and soul-jazz pioneer Lou Donaldson was feted at his 90th birthday gig at Dizzy’s. Accompanied by his longstanding crew of organist Akiko Tsuruga, guitarist Eric Johnson and drummer Fukushi Tainaka, the nonagenarian alto saxophonist performed his classic “Blues Walk,” sang the bluesy “Whiskey Drinking Woman” and sailed over Charlie Parker’s “Now’s the Time” with ageless facility.